I think this time I nailed it! 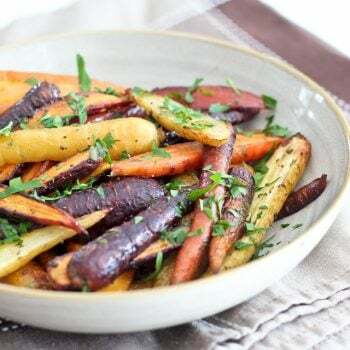 I managed to work both the “quick” and “easy” attributes into a very scrumptious, serve-it-to-your-guests-worthy, Whole30 compliant recipe. Now that don’t mean you have to be expecting company or doing the Whole30 to enjoy this dish, though… You can whip up these Pork Medallions with Mushroom Sauce anytime, in no time at all! For realz, you can expect this beauty to be on your table in about 15 to 20 minutes, tops! Shall we time this, for fun? 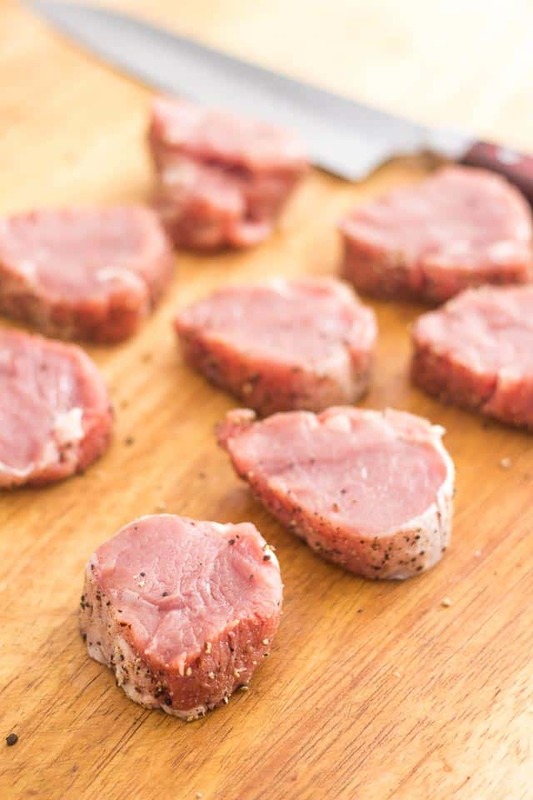 Take the pork tenderloin out of the fridge and sprinkle it with salt and pepper, then slice it into 8 equal sized medallions. No need to take your ruler out. That would take too much time! 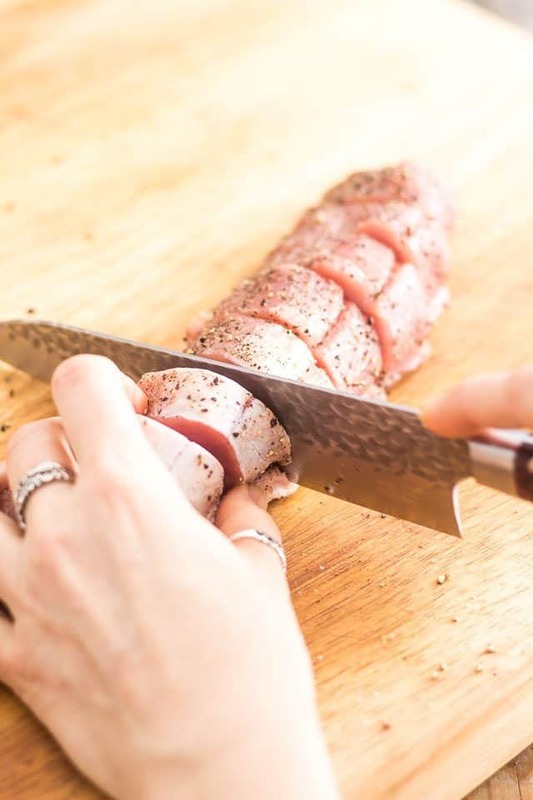 The best way to insure that your medallions are equal is to start by cutting the tenderloin right down the middle, then slice each half in its center, and again, slice those pieces in half. 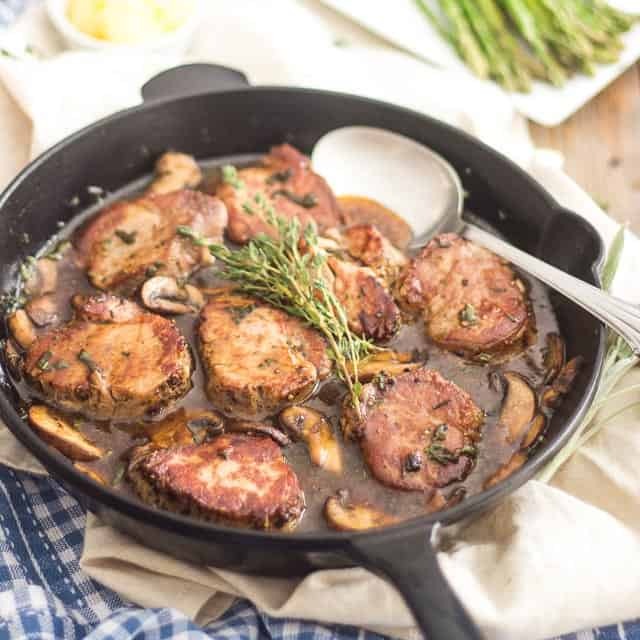 You’ll end up with 8 perfectly even sized, beautiful pork medallions, each about 1½ to 2 inches thick. Let’s see… how long did that take? About 2 minutes, right? Right! Now melt a generous amount of ghee in a heavy skillet (preferably cast iron) set over medium-high heat. When the meat is cooked, remove it to a plate to collect the juices. How are we doing with time so far? That was 8 minutes, plus the 2 minutes that it took to slice the meat, so we’re now at 10 minutes. Good! 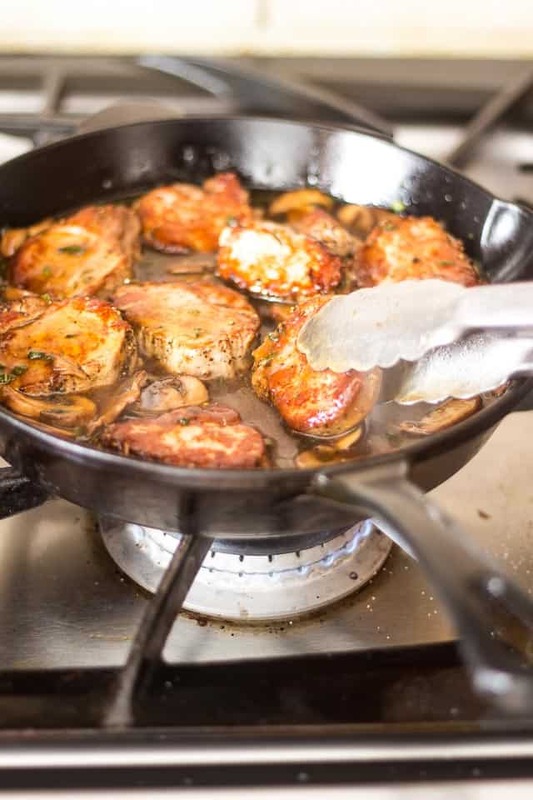 While the meat is cooking, slice the mushrooms (that’ll keep your hands occupied so you won’t feel so tempted to move that meat around) and then add them to the hot pan. 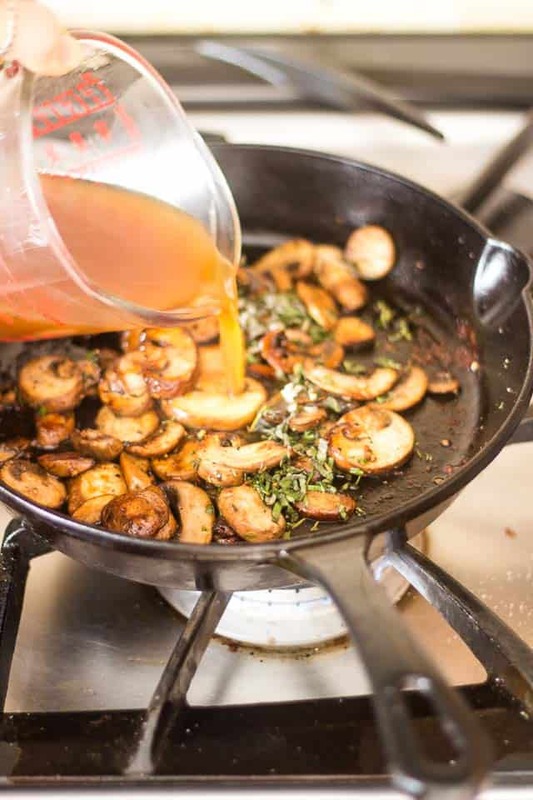 Don’t hesitate to add more ghee if and as necessary so the mushrooms get to turn a beautiful, golden color, which should take no more than 5 minutes. 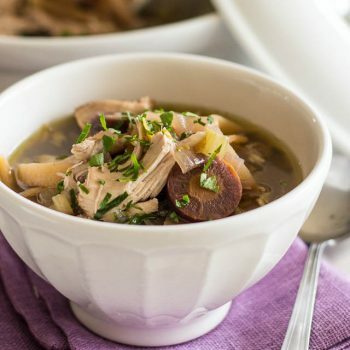 When the mushrooms are cooked to your liking, add the fresh herbs and chicken stock to the pan. Dilute the tapioca starch in water and throw that in as well. Bring to the boil and continue cooking until the sauce thickens, about 1 minute. 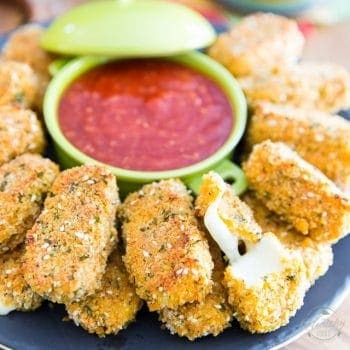 Add the medallions, along with their cooking juices, back into the pan and spoon some of that delicious sauce over them. Kill the heat and allow the meat to sit in the sauce for about 5 minutes. Mind you, if you were in a real hurry, or crazy stupid ravenous, you could very well skip that step and dig right in. Heck, you could probably eat this right off the pan, if you wanted to. But really, you should take the time to set the table while this is resting and then sit yourself down to a beautiful plate filled with tender, juicy pieces of meat topped with a rich and generous mushroom sauce… The dining experience will be that much more pleasant! So was that quick and easy enough for you? I hope so! Now for the taste test… I will let you be the judge of that, but personally, I absolutely adored this dish. Mind you, I’m such a huge fan of pork tenderloin, it would have been hard for me not to like it. I find that cut of meat to be so naturally tender and tasty, you hardly need to do much at all to it to turn it into something spectacular. So long as you don’t overcook it (it’s at its best when still slightly pink in the center) and season it well, it’s hard to go wrong. I really wish I could have it more often, but hey, a pig only produces 2 of these delicious fillets, so gotta respect that, you know. 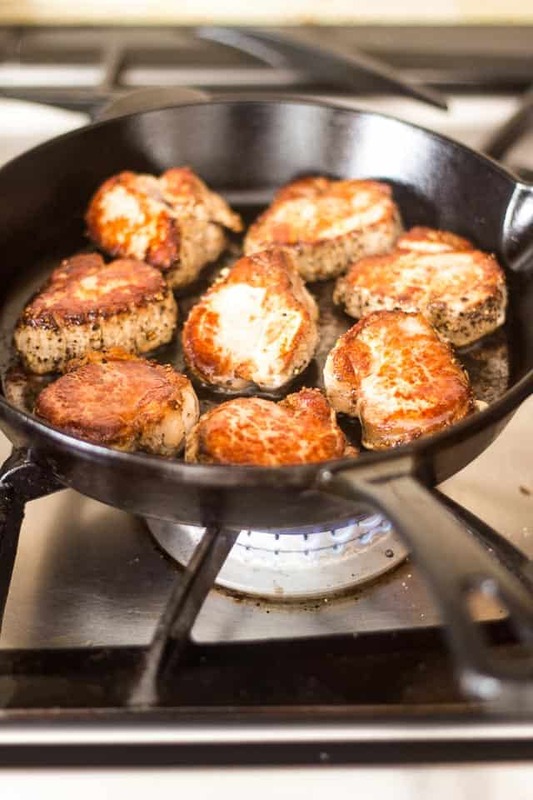 Sprinkle the pork tenderloin with the salt and pepper and slice into 8 equal sized medallions. Melt a generous amount of ghee in a heavy skillet (preferably cast iron) set over medium-high heat. 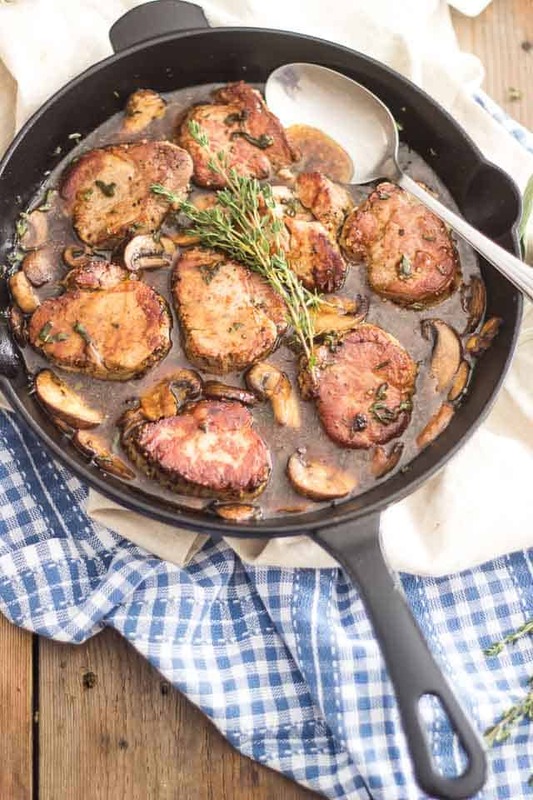 When the pan is hot enough, add the pork medallions and cook them for 4 minutes per side, without moving them, until they develop a nice golden crust. Remove to a plate to collect the juices. 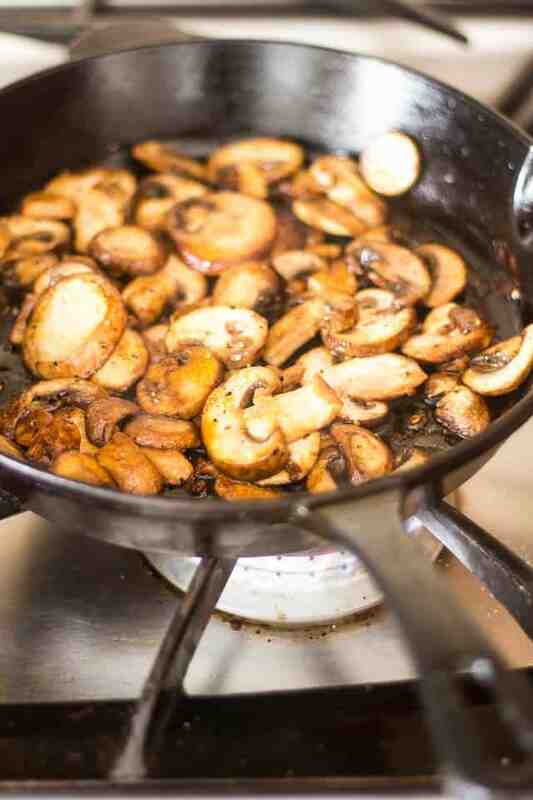 Add the mushrooms to the skillet and cook them, stirring often, until they turn a beautiful golden color, about 5 minutes. Don’t hesitate to add more ghee if and as necessary. 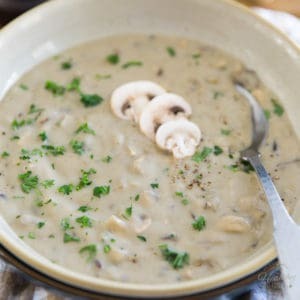 When the mushrooms are cooked to your liking, add the fresh herbs and chicken stock, followed with tapioca starch diluted in water; bring to the boil and continue cooking until the sauce thickens, about 1 minute. Add the medallions, along with their cooking juices, back into the pan and spoon some sauce over them. Kill the heat and allow the meat to sit in the sauce for about 5 minutes, then serve. Oh yum!!!! 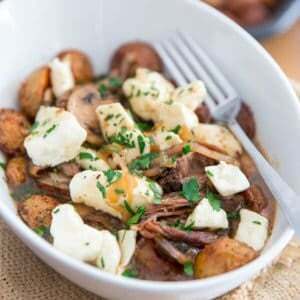 I’ll definitely be making this recipe….looks delish!!! Thank you Karen! 🙂 Hope you like! Sounds wonderful Sonia! Question: I’m thinking about what less expensive pork cuts might be used, pork chops perhaps, and what if any alterations might be needed? I’m thinking probably trimming off edge fat before searing and perhaps removing excess pan fat after braising, (but not too much)! P.S. I grew up eating beef heart, tounge and veal (before I knew better) kidneys and other delicacies like raw oysters. Yummm. But, that was back in the day 1950s – 60s and our parents grew up during the depression when creativity and cheap meat always went hand & hand! 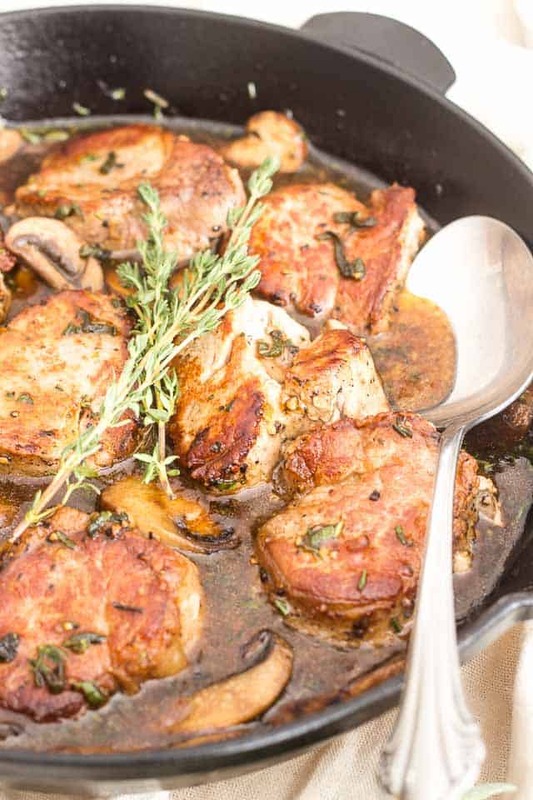 Pork chops would definitely work, Kathy, only I would let them simmer for a much longer time, until they became really tender… Pork loin would be another viable option! 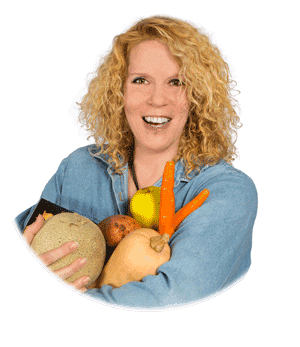 Nothing will do exactly what starch does, Christina… you could use arrowroot, or potato starch, if you had that on hand! I always use corn starch to thicken sauces. I’ve never had those others in my house but always have corn starch. It is a miracle food item, I keep it in the kitchen and another in the bath. Lots of uses, including the best thing for diaper rash or other skin rashes. Will it still taste great if you use half ghee half lard? I am loving your website! could you use coconut oil instead of ghee? Thank you! Made this for supper tonight and it was so good. The sauce was so tasty. Unfortunately, I did not have tapioca starch, so I had to use arrowroot flour, which I’m not crazy about. Was still a great meal….and I loved how easy and quick it was to make. Thanks Sonia. 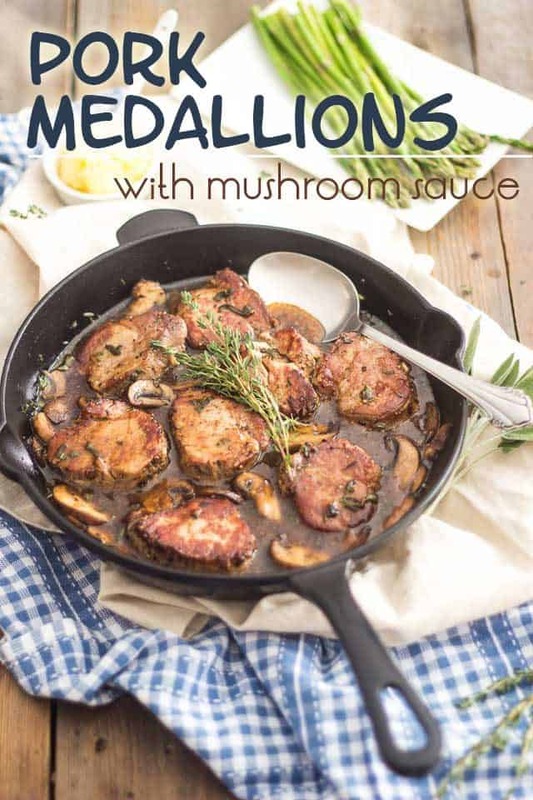 Brilliant recipe- I polished off 6 medallions to myself! I too used arrowroot flour due to unavailability of tapioca starch, and loved it all the same. It’s a shame that all the best paleo sauces, such as this one, leave me craving a big piece of crusty bread to mop them up! Would you mind me reposting this recipe on my blog, with links & references of course! Brilliant, Alex. Thank you much, and real happy to hear you liked the recipe THAT much! I was given a tenderloin by a friend who was going away on vacation and had no idea what to do with it. So great to find a recipe for tenderloin that doesn’t have a cream based sauce. 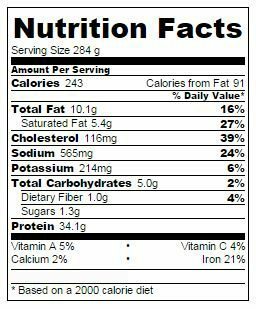 Not that they aren’t delicious – but I usually prefer something a little lighter! When I saw this dish, I was worried that the sauce might not be flavoursome enough. I was very wrong to worry… It’s one of the tastiest dishes I’ve cooked in a long time! It’s become a family favourite now. 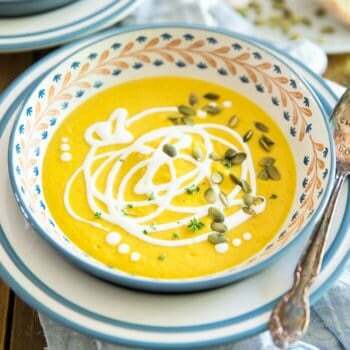 Hi, I’m going to try this dish – what would you suggest it’s best served with please? Cauliflower mash would be grand! Or maybe some roasted butternut squash. Steamed rice or egg noodles would be great options, too! Being a Southern girl, I served it with grits! Delicious! Yum! Glad it was to your liking, Nancy. Love your choice of side, too! What a pretentious recipe. Great it’s quick but himylayan salt ?? And I had to Google ghee, which is (let’s face it) just butter. I’m not a frequent cook and this I why, people who cook want to somehow use it to show how special they are. I took this recipe and put in ordinary ingredients, y’know the ones you can buy in regular stores without going to a posh deli and it was pretty good. NOTHING pretentious about this nice straightforward recipe and charming directions. Ghee is no longer exotic. And, I love that this blogger’s spelling and punctuation is correct!!! Just tried your recipe and it worked out great. I used coconut oil for the meat (didn’t have time to make clarified butter but will do that next time). I added some butter later to fry the mushrooms. You don’t say how much stock to add and I ended up with quite a bit. (Thickened with cornstarch and double cream). 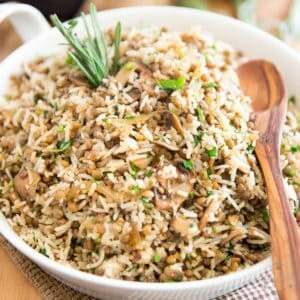 I added half a clove of crushed garlic to the mushrooms when they were half cooked. It tasted great and I ate it with half a loaf of fresh bread. Next time I’ll try it with just half a pint of stock. Thanks for the recipe. I’ll certainly have this again. BTW, I only made three medallions this time: two for me and one for my wife. Sorry, you did indeed say how much stock to add. I was following the recipe on my iPhone and didn’t see the ingredient. I tried again today and did much better. Served with braised Belgian endive and dauphinois potatoes. My first time with cooking the former and my best effort so far with the latter. Hahaha oh no! It should reheat just fine, Kimberly, although fresh is always better! 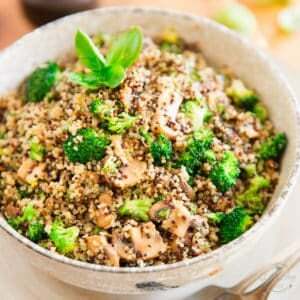 I love your writing style – I haven’t have come across humour and cooking ! I will also try this recipes.